Lately, I've been obsessed with decluttering and organizing and I thought what better time to share my tips and insights with you than now. I've been amazed about the instant shifts and changes that appear in my life after I declutter, clean and organize a space or area in my surroundings. We live in vibrational Universe, where everything is made out of energy - yes, that includes all of your stuff, old magazines laying around and the Christmas sweater, you haven't worn in the last 5 years. All those things, have their unique energy imprint and they impact you in various ways. If you feel stuck for a while, then it's time to give your life a major makeover. The best way to do this is by getting rid of all those stagnant energies that are sneaking in your home, body and mind. I know that decluttering and cleaning can be very overwhelming, especially if you stand in front of a giant pile of clothes or messy drawers. Trust me, I've been there... and by "there" read getting major anxiety only from the thought of sorting out my papers and documents... or deleting irrelevant photos of my phone, or organizing my work files, or... you got the point, right? 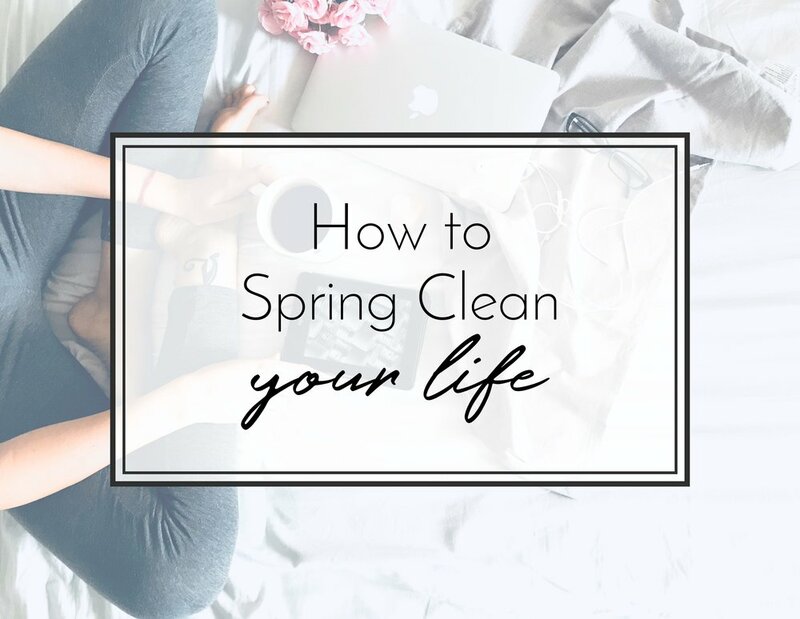 That's why, I decided to put together a week long plan, that will guide you step by step through your Spring Clean process. Not only that, but I created a custom Trello board, where you can find your tasks and checklist for each day. In a perfect world, after a week you will have clutter-free life. In a not so perfect world, a.k.a "the real life", where sh*t happens and "I have stuff to do!" it may take you a bit longer. But it doesn't matter because you will have a clear structure and a goal, that will help you stay on track and... sane, during the process. Shall we start, then? If you are familiar with the Law of Attraction or the immense power of our mind, you know that our reality reflects our thoughts and our inner state of being. That is why having the right mindset is crucial for the success of every endeavor, no matter how big or small. If you don't practice mindfulness on a daily basis, I would strongly suggest to add it to your routine and to start your Spring Clean week with detoxing your mind. If you are new to meditation or if you get overwhelmed, just by the thought of it, start with baby steps. I am planning to do an entire post for meditation for beginners, but 5 minutes a day is all you need to see a difference in your mind and life. For me the best time for meditation is early in the morning as part of my morning routine or before going to bed at night. You can choose the best time according to your schedule. Sit in a comfortable position with your eyes closed. Relax your body and start focusing on your breathing. Breath in through your nose and out through your mouth, while observing your body and staying mindful of your breathing. Do this several times. When you feel fully relaxed, just be aware of yourself and your being. Thoughts will come and go. Let them go. Try not to attach yourself to your thoughts and just observe them. You can also try to focus on a single word like love, abundance, health. Whatever you want in your life right now and see what's coming for you. I will also suggest to set up a timer before your practice, as this will give you a timeframe at the beginning and you don't have to worry how much time you have left. If this is too much for you and you still find it difficult to relax and give direction of your thoughts, try guided meditations. There are tons of free guided meditations on YouTube with various topics and purposes, so find the one that is right for you. In my experience they are great for beginners or for days, when it is just too hard to unwind on your own. Remember that consistency is better than perfection. You will get better in time and it will get easier. And I pinky promise - you will actually start to enjoy your meditation practice. I know I go into deep waters with this one, but there is no way I can skip on the importance of detoxifying the body. Our bodies are capable of wonders, but we tend to require way too much from them, while giving too little back. Regular detoxing is just that - giving back to your body. More energy, better focus, clear skin and healthy digestion are only few of the benefits of detoxing. I am well aware that this step will look different for everybody depending on your diet, age, physical activity, nutritional requirements and so on. There is NO "one size fits all" type of solution, especially when it comes to detoxing. Regardless, I invite you to do something detoxifying for your body, however small it may be. Avoid processed and fried foods, soda, table sugar, etc. NOTE | ALWAYS CONSULT YOUR PHYSICIAN BEFORE IMPLEMENTING ANY DIETARY OR LIFESTYLE CHANGES. We spend the majority of our time at work, that's why I am starting the physical detox from your working space. Whether you work from home or you go to an actual working place, you will greatly benefit from placing everything in order. And please don't tell me that you are creative person, and you don't really need that because you thrive at chaos... I've been there too! So, trust me when I say - clean, organized desk is way better for your creative juices! You don't believe me? Try it for yourself and prove me wrong. Another major consumer of our time is... The Internet! And as we spend lots of our time there, naturally we create a lot of clutter. Unorganized files on your computer, tons of unopened emails, weird screenshots on your phone and dozens of people, who you have no idea what are doing in your friend list are considerable clutter makers. I guess you already know what to do with them, but in case you have any doubts... Delete, remove, unsubscribe, unfollow, erase, archive - let them go! Just let them go! Open a space for new amazing opportunities and exciting connections to enter your life. You can thank me later, now go and organize! You know the drill by now, but I am going to hit you one more time (any Britney fans, here?)! Everything is made out of energy, things are energy and same goes for your clothes. Have you ever wore a t-shirt and you felt absolutely amazing in it? - Good! Now, have you ever wore a t-shirt and you felt like the world goes down? - I thought so! That's because clothes have vibes, too! And we want those which are Vibe Buzzers, not Vibe Killers in your closet. It makes sense, right? Start your wardrobe detox by following my step-by-step guide in the board on Trello. Depending on where you live and how big is your apartment or house, this step of the process might take a bit more than a day. Whether it is my yearly or weekly cleaning, I usually start with organizing my bedroom. My bedroom is my sanctuary - I unwind there, relax and recharge myself. So for me it's very important to have this space clean and organized. I bet you also have a room, that is more special for you than the rest, so I advise you to start your cleaning from there. Once your have your favorite room all jazzed up, you'll get excited to continue with the rest. Take as much time as you need and don't push yourself to finish in a day, or even in a week. One step at the time in the right direction is all you need. You've got this, girl! Take some time for self-care - take hot bath, apply face mask, read nice book, have massage, etc. Be proud with yourself - you did a great job! Oh, and don't forget to grab your TRELLO BOARD! How do you feel about this Spring Clean Action Plan? Is it something you would do? Let me know in the comments below! I am always happy to hear from you!